Mowers Direct Announces Best Mid-Grade Zero Turn Mowers. Recommendations Based on Sales History and Customer Reviews. Today MowersDirect.com announced its recommendations for the best mid-grade zero turn lawn mowers. "Mid-grade zero turn mowers offer performance features such as wider mowing decks and 3-blade cutting systems," said Todd Gwaltney, resident product expert at Mowers Direct, one of the fastest growing e-commerce companies in the United States. "The features on mid-grade ZTRs will allow you to mow your lawn quickly." Gwaltney added that many retailers and power equipment dealers only carry one or two brands of zero turn mowers. However, MowersDirect.com is no ordinary retailer. The online superstore specializes exclusively in lawn mowers and turf equipment and carries more than 20 mid-grade zero turn mowers from the leading national brands – one of the widest assortments anywhere. The online retailer combined retail prices, recent sales history, customer reviews and personal insight to generate their final recommendations. Once the dust and data settled, only three mid-grade zero turn lawnmowers sold by Mowers Direct were given their prestigious "Recommended" status. In addition, Gwaltney personally wrote online reviews for each zero turning radius mower, explaining why the company recommended it. 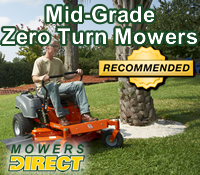 By providing the recommendations and reviews, MowersDirect.com hopes to arm shoppers with enough ammunition to pick the perfect mid-grade zero turn mower for their needs.